Steve made the fire pit! He went from idea, to sketch, to supplies, to built in less than 48 hours. He’s a stud, what can I say? First item of business was to visit Lowe’s and pick up all of the supplies. Low … ri … der … drives a little slower. Ba da ba dadadadadada. 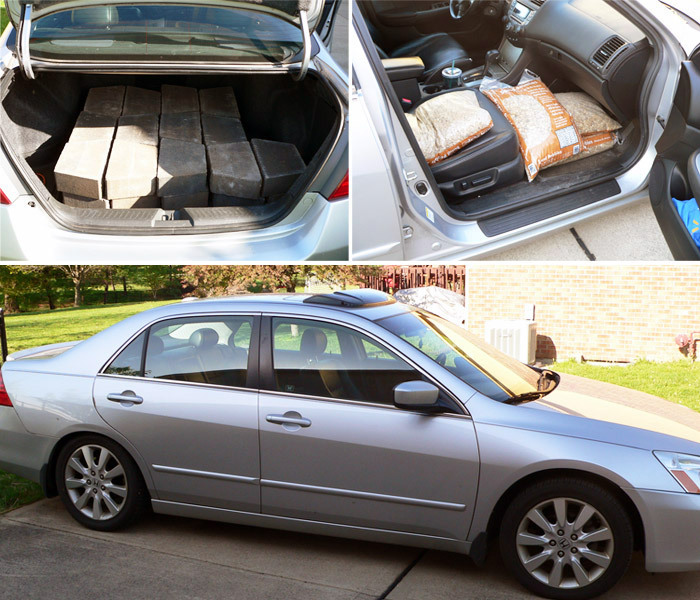 He had to make two – count ’em — TWO TRIPS because of how heavy the stones and gravel were. He said he felt like a pimp driving home in his lowrider. Did he really say that? No, no he didn’t. But I assume he was at least thinking it. he marked off exactly where it needed to go. The ole stick-in-the-ground-acting-as-your-pivot-point trick. Only the most high-tech tools for us here at The Harpster Home. While Steve was busy working, Olive sternly guarded All The Things. She gets paid hourly. One water break. We run a tight ship. The next series of steps moved smoothly since all of the prep work was done. If you’re following along at home, make sure between all of these steps you take time to place a level on each possible stone combination. The rule of thumb is if the first layer of stones is even, you shall move forward to the next level. Sorta like Super Mario 3, but without having to beat Bowser first. Isn’t it pretty awesome? I can’t believe I ever doubted the beautifulness of the fire pit. Lesson learned. I’m so proud of Steve and our new backyard attraction, and I can’t wait to have our first marshmallow-roasting session. The only minor tweak that Steve mentioned wanting to do in the future was to extend the pebble rim. He thinks it would be slightly more functional if it had a larger gravel edge to it. I suppose for easier mowing. I could go either way. I think it looks pretty super just how it is. The natural progression was to ponder what Olive would look like inside of the fire pit. Ask and you shall receive. Oh, you didn’t ask? TOO BAD. She seemed perfectly content in there. Almost too content. I wouldn’t be surprised if all my neighbors had their index fingers on the last “1” in “911” as they saw me slowly lower my dog inside a fire receptacle. Oh, silly neighbors. When will you learn that our mascot is simply just modeling our newest project, like always? Oh! That reminds me. 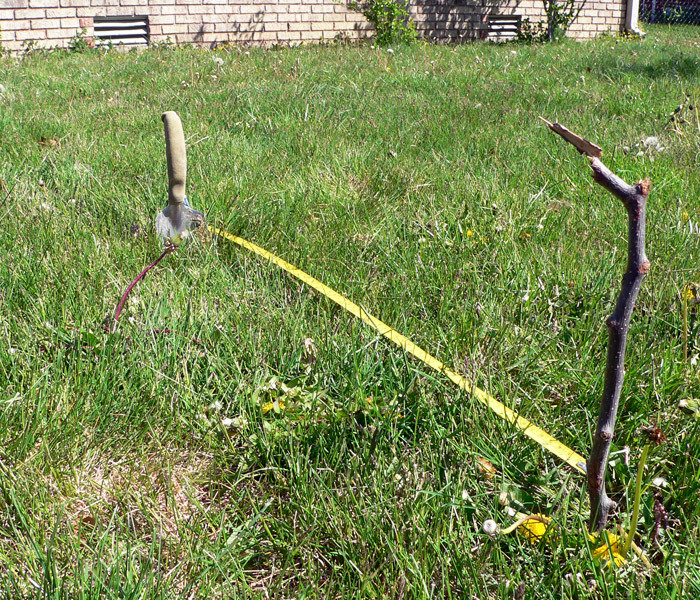 I’m planting a tree fence this weekend between our yard, and Ned Flanders’. More on that later. Good luck to you if you’re going to give this build a try! Steve found lots of you tube videos that helped him along with the process, and there are tons of other resources out there. Don’t hesitate to holler if you have any questions, though. Enjoy the rest of your week and think of us fondly next time you eat s’mores. Psst! Will you take my two second survey? 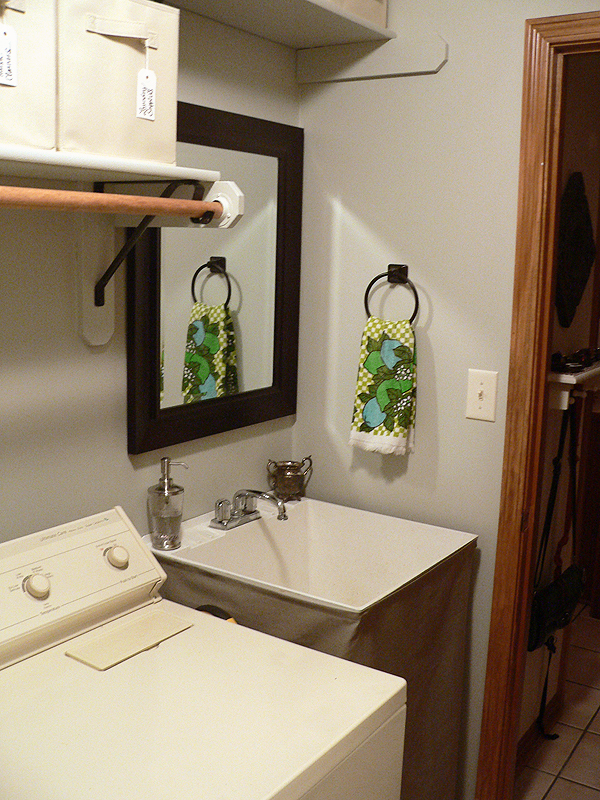 This entry was posted in DIY - Built projects by mojo. Bookmark the permalink. Looks good! I bet you’ll enjoy it. This made me smile this morning! Looks great! And I’m glad Olive understands that this is an Olive safety fort first, fire pit second. Yes I officially have that song in my head. Miss you! 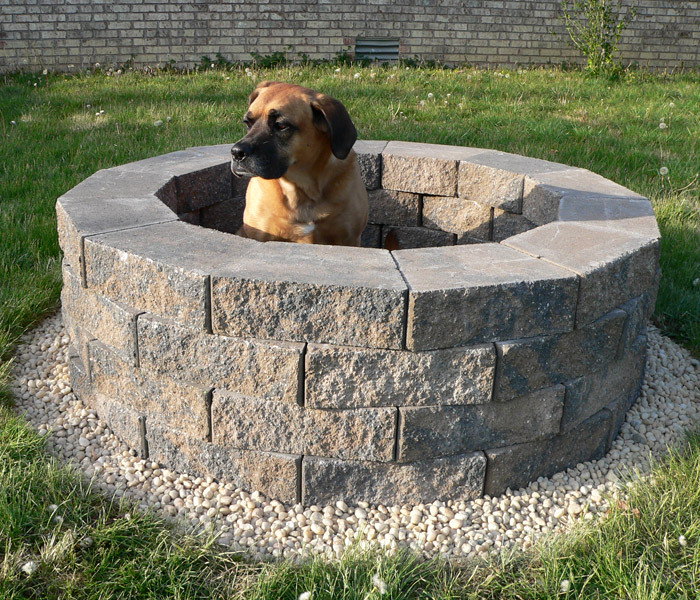 Looks Great, and Olive looked nice modeling in it too 🙂 Questions for you… What are the dimensions of the fire pit you built and appox. how many stones? Thanks Stacey! The pebbles have a diameter of 5 feet and the stones have an outer diameter of 4 feet. It’s 4 rows high, and Steve used 52 stones and 4 cubic feet of pebbles. I hope that helps! How big were the paving stones? Did he use any adhesive to hold the bricks together? You made that look pretty easy. I watch Yard Crashers and I love when they do fire pits. Trying to talk my husband into it. Would love to ditch the rusty old metal on we bought at Aubuchon Hardware =) Thanks for sharing. Love it!! 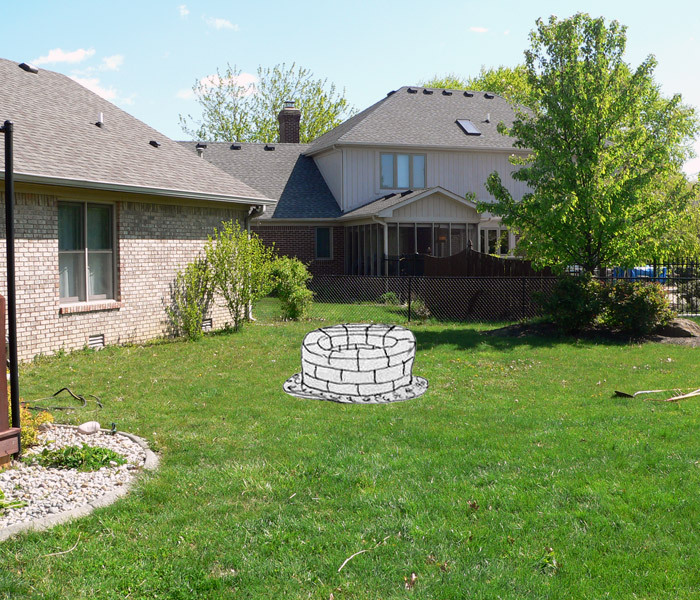 We also have been planning to build our own “pit” in the back yard! One question…do you have to do anything to keep the bricks from cracking or possibly exploding due to the heat of the fire?? I thought I read somewhere that we had to use special bricks or apply a coating of something…which is why we have lagged on making our own pit! We just got regular ole concrete pavers from Lowes. The only info we read regarding exploding bricks was about any type of river rock. We steered clear of that and everything has been smooth sailing. It might have to do with how hot your fire gets and how close it is to the stones. We have a fire pit with only 2 layers of stones, and we sometimes end up with a largish fire when burning yard debris, so many of ours have cracked. On the other hand, they stayed in place and there have been no explosions! Thanks for this blog – a really fun read on a snowy Dec day in WI! This is so true Ashley, these landscape bricks will crack when you place a fire inside, I know this from experience!! We’ve had several fires and have never had a problem with cracking. Maybe you used a different kind of stone? LOL oh my goodness.. just stumbled across your blog, and you have me litteraly laughing out loud here at work.. thanks for that! 🙂 You have jsut gained a new reader! Keep it up 🙂 Go Bucks! P.S. the pit does look fantastic, and makes me think I can do it too! Looks wonderful. Just wondering, won’t the pebbles pop out when they get hot. Once had a wiennie roast in gravel driveway. When rocks got hot, they were popping everywhere. We have only used it once, and did not have any pebble-jumping problems. I wonder if it was a certain kind of pebble that doesn’t react well with heat? This is very likely the most entertaining blog post I’ve read since my super-witty friend returned from a year in Germany & stopped blogging about her family’s adventure there. Olive is adorable, by the way. What kind of pebbles did you use? I don’t think it’s very professional to be snorting soda out of your nose at work, but unfortunately for me, that just happened. Great post. Love the firepit (I found it on Pinterest & pinned it to one of my boards). But I have to say I love Olive even more. We have an 86 lb American Bulldog 3 yr old baby. Her name is Kai. We do goofy things to her, too (like dressing her up as Mary last year for Christmas). She sits there looking like Olive…regal and above it all. 🙂 I saw Olive’s pic down below and it reminded me of Mary Dog. I must run and clean up the soda spillage. I’ve been wanting to put a fire pit in my yard. So glad I came across this!! what was the total cost of the fire pit? how deep is the layer of pebbles? Sandra, I believe it was just shy of $100, and the pebbles are only about 3″ deep. Hope that helps! 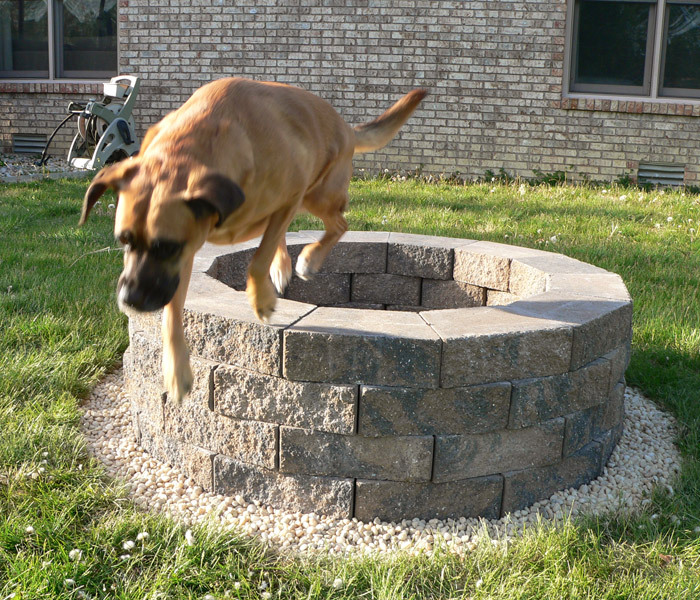 Your firepit pinned over on pininterest – glad I followed it here, your blog is a hoot. I thouht putting the dog in the fire pit was the natural next step, too. I love the idea! How big we’re the paving stones? Were they 12″ or 16″? This looks great how much would you say it cost you? I love this! We’re totally doing it. 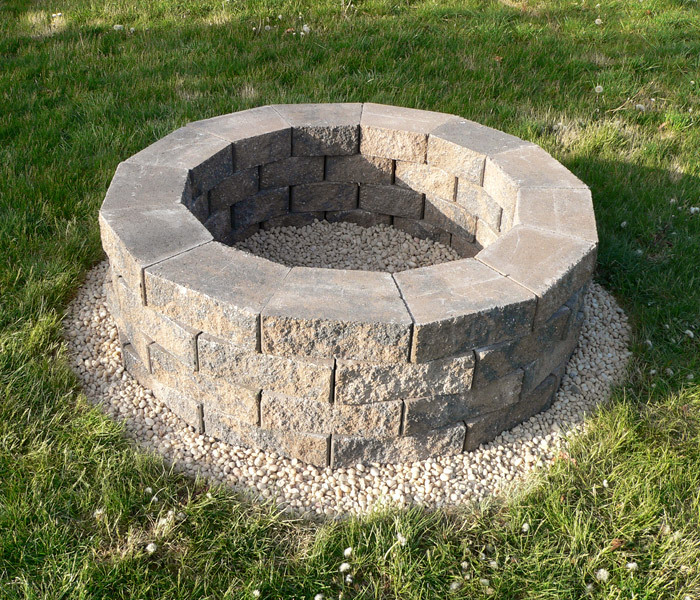 Hubby has been planning a fire pit for a while but his plans are a lot more… ‘man-like’ (read: complicated). This actually looks doable. I think the only thing I’d change is separating a few of the stones to make air holes… Otherwise It looks great! Dog and all! Thanks Sarah! There actually are air holes between the stones in ours, but for some reason in the picture they look like they are right up next to each other, so you’re definitely right about needing oxygen. Good luck with yours! That pit surround is probably against fire code in your area, and is quite possibly dangerous. 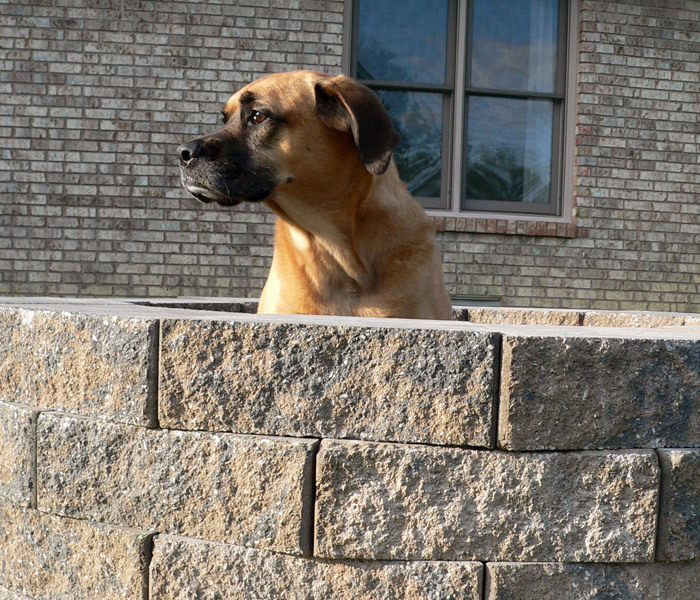 Landscaping brick is usually made using high moister/absorbent cement, and can shatter when heated unevenly . I’ve seen bricks almost exactly like those blow up like a grenade, sending rock chips about 15 feet. Even if you’ve used it a few times safely, those bricks will absorb moisture if you have a few weeks of high moisture or rain. We researched a bunch before jumping into this project and we learned we are definitely not against the fire code in our area, and that sandstone (which is what we used) is perfectly safe for fire pits. I will be sure to write a warning post if our fire pit explodes. Thanks for all of your concern, eldorel! Great tutorial! Just pinned this to Pinterest if I ever get around to make one for myself! did you do anything to make sure the bricks stay together? Does that make sense? Or did you just stack them on top of each other? Nope! It’s actually best not to seal them up because the fire needs oxygen. The stones are heavy enough that they don’t get jostled around, and they stay put exactly where you place them. Side effect of having vents is that water can also drain out when it rains, as well as soaking down thru the rocks and base material (looked like sand). Loved reading your blog! Very entertaining at 3:30 am. Olive did a great job at her guard post, she deserves the first hot dog cooked on it! Was amused by your blog when I pinned in to check out your how-to on the fire pit. My daughter and son-in-law are in process of setting up their country home for family/friends get-togethers. Think this would make an excellent w/e project that they would enjoy for a long time. Love Olive, our pets are family to us, too. They definitely enrich our lives. Look forward to checking out your posts in future! Thank you so much Kristie. A home in the country, with get-togethers sounds wonderful! I love this project. I think that I could even do it……maybe. About how many blocks did you buy? I believe he used 52 pavers, but you might want to get 55 just be safe. what is included in step 3? Step 3 is just removing the grass, and digging a shallow hole about 3″ deep. Fantastic! I’ve been looking for a tutorial like this, that looks easy enough and has aesthetically pleasing results! Will you post a picture of it when you have it alight? Thanks Lisa! I will definitely snap a picture next time we have a roaring fire. Methinks Mr. Harpster needs a pickup truck if he’s going to keep doing DIY projects like this. Either that, or go to Home Depot where he can rent one. Can I get a list of supplies for the fire pit. Please. How do you intend to clean out the ashes after so many fires in that wonderful pit? And how do you get your marshmallows close to the glowing embers when it’s so deep, without the marshmallows falling off your stick? We haven’t had an ash problem, yet. I guess if they’re too many we’ll just scoop them out. And the marshmallows toast just like on any regular ole campfire. I am so glad we stumbled across this before embarking on building a firepit. We have talked it to death so now you have inspired us to “go ahead!” Thanks sfor sharing. Hot damn that is awesome! Along with the fire pit I am going to build a cob oven. I can bake bread and roast marshmallows! Given that these are pretty standard supplies from Lowe’s, do you mind sharing the supply costs with us? Thank you!!!! I think we did the entire thing for just under $100. Really? My husband’s guesstimate, when he looked at it, was around $300. I will definitely have to take a closer look at doing that this year. Thanks!!! Did you use fireproof pavers? Lowe’s has this project on their website, but has a “bowl” inserted at the top. They say if you intend to use it without the bowl, you need to use fireproof pavers. I would recommend talking to whomever you buy your pavers from, to make sure they can withstand the heat. Hi there. I love this and I want to do it, but my question is.. do you use cement in between the layers? Nope! Don’t use anything in between the layers. Fire needs oxygen. 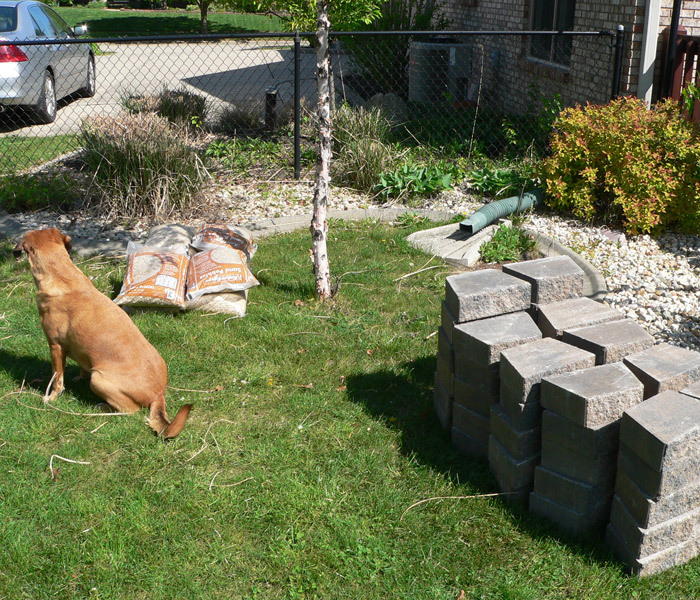 I just counted them from the picture – it looks like we used 13 stones, and had 4 layers, so that equals 52 pavers. We did not use anything to hold them together. The fire needs oxygen to breathe! Does it fill with water when it rains? Love the firepit infographic. Some of these DIY gardening ideas are often way beyond most people. I actually think I could complete this one – I even have a dog who could get in the way while I’m working. I wanted to take your survey but it would only let me answer once and I wanted to mark all of them….especially More Cowbell….thanks for taking the time to blog and post for us. Did the pavers have a lip on the bottom of them? I am so going to do this before winter. We have a movable pit that I have been wanting to upgrade to something like this. Thanks for the instructions, one question did you adhere the stones somehow or are they just stacked? How many of the bricks did it take? Great job!! My wife forwarded your post. I’m expecting to build one myself now! I like how you went about taking the pics when you did. Making this a definite DIM project that won’t be tough to accomplish. If you would build a 16’tall 25′ wide 50′ long lean to cover for the back of a shop so I can DIM ( do it myself )!! Thanks and keep up the great work!! Love the fire pit ! But also love Olive. My dog looks EXACTLY like her. It’s so similiar its weird. did you just lay the brick or did you cement it also? Did you have to cut the pavers? They look like they were cut to size. How many bricks were needed? How many bags of gravel were used? Did he glue the bricks together? If so, with what? Approximately how much did this cost? Been wanting one of these for quite a while and no one to help. BUT son old enough to help now. 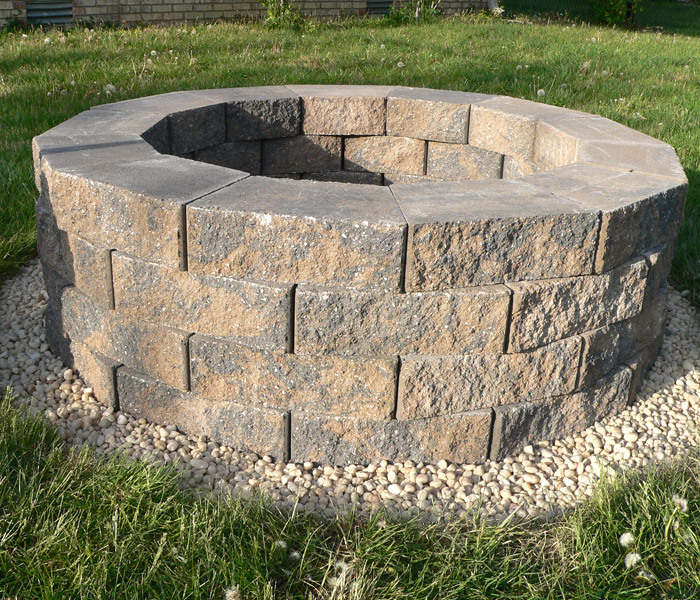 Buying pavers on 4/19 and weather permitting, we’re making this! Thanks, I’ll take pictures and put them on Pinterest. Thanks again! Love the firepit. Id like to make this summer would you list the tools and supples needed. I love this. Want to do one like it but instead of more pebbles I would lay brick or stone flat all the way around so when mowing the mower or trimmer does not hit any pebbles which can hit kids, people, animals, windows, etc. Like the idea, made mine years ago. Lined the floor with 6×12 concrete pavers (low moisture/no explosions over 10 years of use – including all weekenders). This made it easier to clean the pit when fires are done! Also be sure to check the size of pits allowed by local code. Mine is 1″ short of 3′ which is the local limit! what type of brick was it?? I know this is a whole year late, but just stumbled across this. I love your pit, but have one recommendation. Add a metal fire ring just inside the brick wall. It will protect the stones and keep them from charring so badly and eventually cracking. 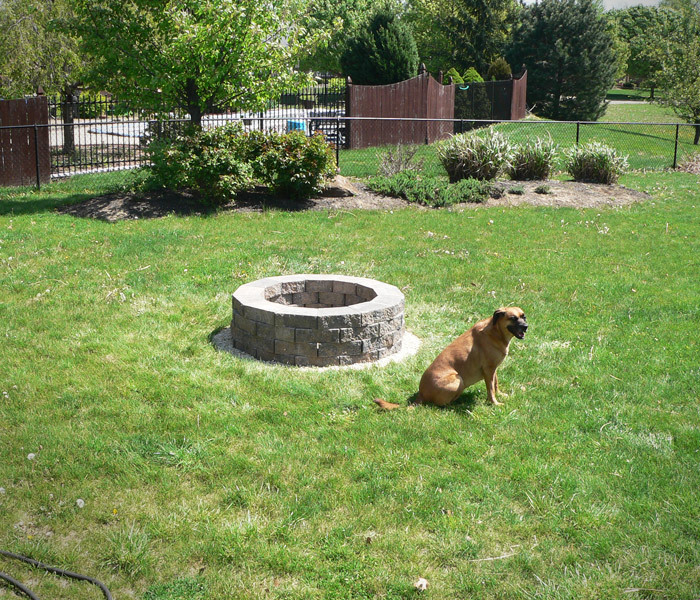 We built one too, but the metal fire ring was part of the instructions. Have started this but can’t find the pavers! Would you be able to measure the dimensions of yours? Did yours have the lip on the bottom of the pavers? You can get the pavers at Lowes or Home Depot. The ones without the lips work best, but you can chip away the lips. Nice details in the picture. I was wondering what the inside diameter of the pit is. I was thinking of ordering a metal liner with a lip but I don’t know the dimensions. What was the name of the type of block you purchased (i looked into this before and there were so many different types!) Did you use small stone or sandstone or something else for the base before laying the block? Thanks! Looks great! I’ve made and helped make several pits before, but I want to make an official one this time (and move away from my natural field stone type fire pit). nice firepit. beautiful dog. what was the total cost of the project? Nice project! P.S. Better than Low Rider…. Secret AAAAAAgent Man! Now That will stay with you all day long!!!!! 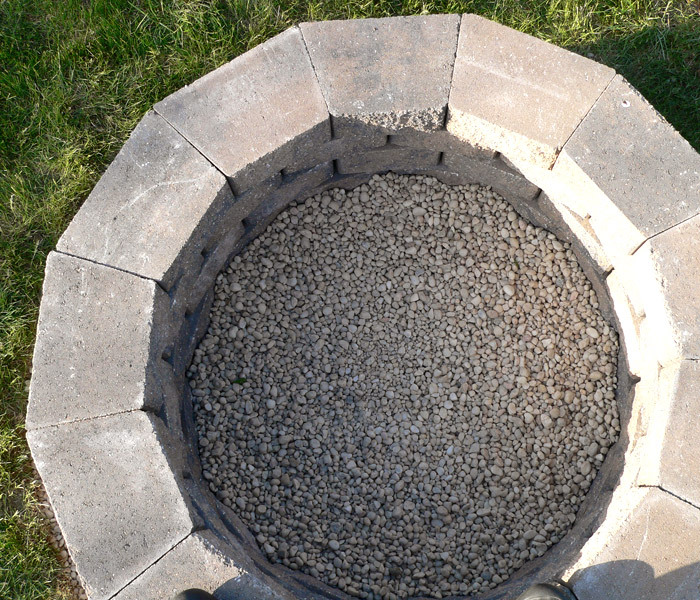 The fire pit looks great, I’ve been looking at how to build a fire pit myself, and it doesn’t seem too bad. How wide is your firepit? What is the diameter?